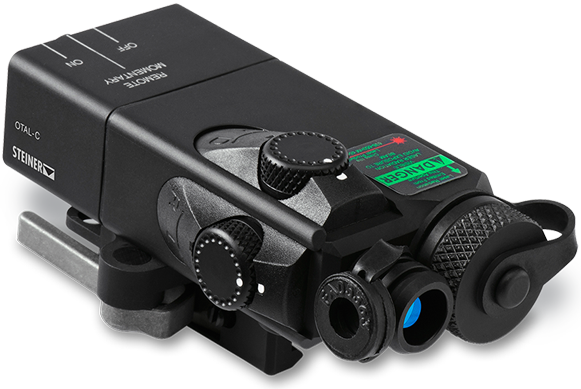 The rugged and compact OTAL-C (Classic) LASER is used by Military and Law Enforcement agencies worldwide. The OTAL-C is designed with the latest cutting edge technology that allows them to be mounted behind the front sight on M-4 style rifles and the LASER is offset to project around the front sight. These LASER's align with the center of the barrel. Classic models are equipped with a RED Visible Pointer (9055) or an Eye-Safe Infrared (9056) Pointer (Old LDI Part # 19206 or 19217). Since they are designed with a Low Profile housing, you can mount the OTAL-Classic in front of scopes, HOLOgraphic sights or Night Vision Devices.